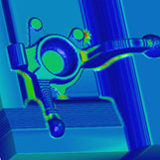 Machining STRATEGIST is a powerful 3D CAM product that generates optimum roughing and finishing CNC toolpaths from the complex shapes generated by all major 3D modelling systems. With demands for ever-shorter lead times and improved quality, High Speed Machining (HSM) is now common place in many mold, tool and die shops both in the CAD/CAM office and on the shop-floor to machine hard materials with increased feed rates. Machining STRATEGIST is a technological leader in this area with many unique machining strategies for generating world-class machining programs. At the same time, many of these strategies can improve the productivity of older CNC machines with dramatically reduced air cutting time and programs with smooth arcs which help to maintain continuous machine tool motion. Machining STRATEGIST has been developed to be very easy to learn and use and training is typically only one to two days in total. The software has context sensitive menus and dialog boxes and is intuitive to drive, while many parameters are calculated automatically or remembered to minimize operator input. Operations are driven from a browser-like tree structure that develops to show the history of the job. The on-line help contains comprehensive and easy to understand text and illustrations while every effort has been made to ensure that it is written in plain English. The help is fully context sensitive and displays topics relevant to the current operation and dialogue box. Hyperlinks have been incorporated to guide the operator towards useful related topics, making the online help intuitive and easy to navigate. Reading third-party data accurately is critical to the successful operation of a stand-alone CAM system. IGES 3D surface and solids data can be read in to Machining STRATEGIST together with VDA-FS, STL or direct CATIA interface. An optional native Parasolid reader allows the transfer of Parasolid files from VISI Modelling or other Parasolid-based modellers. Machining STRATEGIST can export STL files, which can be particularly useful after applying fillets to a model. (a) Toolpath passes are generated, calculated to a particular tool and tool holder. (b) Toolpath passes are linked with a home position, rapid moves and toolpath linking moves. There are a number of inherent benefits to this approach. Firstly, if a different linking strategy is required, it is not necessary to recalculate the original toolpath passes. Secondly, if the original toolpath passes require editing, this is done prior to the linking stage resulting in more control and better linking of trimmed toolpaths. Toolpath linking moves were designed to minimize the time the cutter is spent off the job with the net effect that overall machining times are reduced. All machining strategies can be driven in a 3 2 axis orientation. Machining STRATEGIST in 3 2 axis mode is as straightforward as conventional 3-axis machining with 2D boundaries created in 3D space determining the Z-axis machining orientation, which can be set as an AB, AC or BC rotation depending on the particular machine tool setup. Whether machining with a high speed or conventional machine tool, Machining STRATEGIST can help to reduce overall machining times while improving tool life and providing better machine tool motion. Any surface can be viewed at a vector normal to itself and this is particularly useful when positioning the part for 3 2-axis machining. A dynamic sectioning function allows for closer interrogation of cross sectional detail. This can be useful when analysing toolpaths which might otherwize be obscured by steep wall areas or for visually viewing the difference between a remaining material stock model and the finished component. A minimum curvature can be assessed on parts relative to the smallest cutter to be used. By inputting the minimum cutter radius, a new model is generated detailing corners sharper than the specified cutter. Fillets can be used to smooth out the model for machining. Standard radius fillets can be created slightly larger than the ball-cutter to be used. The result will be machining that has continuous movement and no dwelling. Fillets can also be specified to have a different radius to the diameter and this can be useful if 3-axis machining with carbide-insert button cutters. As an example, if machining with a 32r6 cutter, fillets of 34r7 could be created, resulting in smooth, continuous machining even in what were previously sharp internal corners. Fillets are generally produced in seconds, even on large detailed models. With the use of fillets, smooth machine tool motion, better surface finish and improved tool life are assured. Models read in with open hole details can be filled with Machining STRATEGIST, using the planar patch facility, in most cases eliminating the need to take the part back in to a modelling system for modification. Planar surfaces can be modeled if the component is destined to become a core or electrode. If planar holes are located at a vector in space, these can also be filled, by specifying an AB rotation for the boundary used to constrain the planar patch. Machining STRATEGIST automatically looks down the vector path the boundary is created in when performing any associated command such as machining or in this case, creating a planar patch. The history-tree structure within Machining STRATEGIST can be used to record a sequence of events. Rather than recording a macro in advance, the user can selectively specify exactly which machining sequences to record after the operation has been run. This allows the user to build up a selection of operations which can be used to automate other jobs. For instance, a sequence of roughing and rest-roughing operations could be recorded using particular cutters for small, medium and large parts. Within a session of Machining STRATEGIST, the operator can specify the software to retain any values which have been input / overridden. When exiting Machining STRATEGIST, the operator can then save this session as a Profile. Profiles work especially well for different sized components, different operators who wish to work in their own particular style and even different machine-tools, since high speed machine tools benefit from different default parameters to conventional CNC's. Used in conjunction with batch processing, User-definable Profiles can help to make the most of process automation. Machining STRATEGIST's roughing routines employs a number of techniques which, when combined, results in a program with the smoothest cutting motion and significantly enhanced tool life: A series of offset passes are generated at specified Z-depths and are automatically calculated to remove the maximum amount of material without leaving upstands. The depth of cut automatically adapts, ensuring that flat faces are machined to within the prerequisite stock allowance. 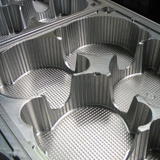 A Core Roughing strategy is optimised to machine from the outside-in, resulting in better cutting conditions when machine cores or parts with upstands. Upon linking the passes, an "effective cutting diameter" helix entry is calculated, completely machining the material under the cutter as it moves to its next Z-depth. Cutter contact is maintained as much as possible to avoid the reduction of tool life. Machining STRATEGIST automatically adapts to a profile ramping condition following the toolpath as the tool ramps down in Z if a helix entry is not possible. If both a helix entry or a profile-ramp entry would leave material under the effective cutting diameter of the cutter, which might result in the cutter being damaged as it drops deeper in Z, Machining STRATEGIST discards this part of the toolpath, to be picked up later by a rest-material re-machining operation. The software cannot plunge vertically down the tool-axis, ensuring safe, reliable cutting conditions at all times. Smoothing arcs are created automatically, eliminating dwelling, improving effective cutting feedrates and tool life. Smoothing arcs are also generated on the most critical pass, where the cutter is in contact with the workpiece stock allowance. Linking moves, from one offset profile to the next, are created with smoothing arcs to maintain a more constant cutting motion Machining STRATEGIST fully gouge protects for not just the tool but also the toolholder. For older machine tools and machining softer materials, a traditional lace-roughing toolpath is available. Constant Engagement With Material Although the Concentric pattern looks much simpler at the first glance the problem is that the tool “digs” into each corner causing the tool to overload, leading to reduced tool life or tool breakage. In reality the machine tool operator may have to reduce the cycle feed rate to compensate and thus, increase the manufacturing time. As Waveform maintains a constant engagement the feed rate can remain at the optimal value throughout the cycle. This will improve the tool life and greatly reduce the risk of tool breakage. The Waveform Pattern To maintain a constant chip load the cycle uses the philosophy that we machine from “Stock to part”. This reduces the amount of intermittent cuts, particularly on external regions, which means the tool is engaged with the material for longer without lifting clear. TRADITIONALly, cycles generally offset the component until they meet the stock. This can lead to the generation of sharp corners and discontinuous tool paths. For pocket regions the tool will helical in to depth at the center and open the pocket up so that it can create a continuous spiral cut until the edge of the pocket is reached. Any remaining corners are then removed. Automatic Adjustment for Tool Engagement To maintain the tool engagement and the chip load the tool path is automatically adjusted to compensate. When cutting into a concave area tool engagement is increased. The cycle adjusts the step over between the passes to compensate and maintain the desired engagement. When cutting a convex area the opposite affect occurs. As the material falls away the tool path step over is increased to maintain the desired engagement. Smooth Tool Path By ensuring the cycle produces a smooth tangent tool path, the velocity of the machine can be maintained and the desired feed rates achieved. This also has the benefit of reducing shaking and vibration on the machine and component. Linking the Tool Path The links within the cycle are aware of the rapid and High Feed rate settings for the machine tool. When moving to the next cut the cycle will automatically choose the fastest method to get to that point. In localised areas the tool will stay at depth, but on long moves the tool retracts and rapids to position. Stay at Depth When the tool stays at depth the path will automatically move around the stock when required. The moves at depth can be at high Feed and allows the user to specify a small retract to stop the tool rubbing on the floor of the part. Simple Interface We have ensured that the cycle uses the information in the part and Code Generator where possible and kept the interface to only 3 modifiers that the user can adjust for the waveform pattern. This ensures the cycle is easy to apply and is integrated into the main Roughing cycle. 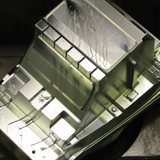 Full Cut Depth Machining (High Speed Machining) Waveform Roughing greatly improves standard roughing by ensuring a constant volume of material is removed. In addition, this also opens up the way to use high speed machining, particularly for hard materials. Cutting along as much of the flute length as possible distributes wear evenly along the entire flute length, rather than just the tip. The radial cut depth is reduced to ensure consistent cutting force allowing cut material to escape from the flutes. Tool life is furtherer extended as most of the heat is removed in the chip. An example of the feed rate and depth of cut that can be achieved in hard materials, both in Metric and Imperial measurements, is listed below. 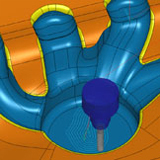 A stock model can be created and used to reference a cutter with greater reach to re-machine areas the previous tool could not machine due to potential toolholder interference. Machining STRATEGIST can rest machine to either a 2D or 3D stock model. 2D stock models are used to build up a series of "slices" from roughing operations which can then be used to rest-rough against progressively smaller cutters. A hybrid toolpath, which profile machines and area clears only where required is automatically generated. 3D stock models can be used in a similar capacity but can be more useful when rest machining at a semi-finish machining stage, for Cast Machining or to purely visualize a composite sequence of machining operations. Since accurate rest roughing toolpaths can become more fragmented, tight control is maintained over the rapid linking moves. This happens with little or no operator intervention since the defaults are set up to function in this fashion automatically. In many cases, the cutter remains deep inside the workpiece when making rapid moves from one cut pass to the next. The result is less air-cutting time and greater productivity. Toolholders can be specified from a standard tooling catalogue or be created according to any toolholders available in the customers shop. These can then be stored in a database, accessible over a network if required. There is no limit to the complexity of the toolholder which can be created. The primary benefit of specifying a toolholder is that, by using short, rigid roughing cutters, large cavities can be roughed out more efficiently by maintaining a greater depth of cut and higher feed rates. As the holder clears the surfaces, the tool can clear out to depths far greater than the actual tool length. Toolholder gouge protection aids in 3 2 axis machining operations since the software will allow the operator to machine areas which might be deemed as otherwize inaccessible unless using this approach. By specifying the toolholder shape, all toolpath calculations will be fully gouge protected including the leading and trailing edges of the defined toolholder. Any set of toolpath passes can be trimmed back to a boundary, or set of boundaries, created in any 3D plane. Toolpath passes can also be edited to stock models and original models. In addition, toolpath passes can also be edited to a toolholder. In operation, a set of toolpath passes can be created without a toolholder. These passes can then be edited to a toolholder whereby the minimum tool length can be established. A complete 3D toolpath can be split into zones based on tool length, with shorter tools being utilised to maintain rigidity, with faster feed rates, followed by longer, less rigid tools with appropriately reduced feedrates. Machining STRATEGIST linking options are designed to keep the cutter in continuous motion and to minimize the time the cutter spends off the job. When roughing and horizontal machining, linking moves are designed to have smoothing arcs and for the cutter to keep in contact with the part for as long as possible. For waterline passes, the default is to keep the cutter in contact with the part as it moves from one Z-level down to the next. If the cutter has to leave the surface to enter at another cut position it will do so with arcing movements. With rapid moves, the default is for shortest route rapids which look ahead at the surfaces/ stock model and take a "racing-line" approach to the next cut move. For all other machining operations, similar approaches are used. While excellent for HSM, these moves can be demanding for older and slower controllers so a second option, minimum vertical retracts can be enabled to still keep the cutter in the part as much as possible. Finally, there is a full vertical retract option which forces the cutter back to a minimum safe Z height. Within all linking options, arc moves maintain continuous machine tool motion. 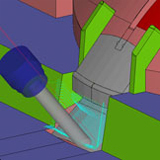 There are two methods of generating sister tooling toolpaths whereby an identical replacement tool is on-hand to replace the current tool after a period of use. The first allows the operator to force a retract every N mm. This has been designed to force a retract on older machine tools which may not have a tool-changer or where the operator only requires a retract move to manually change the cutter or to facilitate an insert change/rotation. The second works from a linked toolpath. It will split the linked toolpath into a number of new toolpaths each with a home position. The operator can specify a linear distance or number of tools to be used. Tool changes will always occur at the end of a cut pass to minimize any marking of the workpiece. Machining STRATEGIST takes advantage of Internet Explorer to display tooling sheets which can be viewed as an HTML document on any suitable computer within a company's internal network, providing a paperless means of distributing tool sheets. Tooling sheets contain comprehensive information and graphics with hyperlinks to the actual tape file itself. 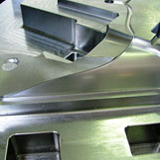 If printouts are required, a more simplistic tooling sheet can be produced without graphics. Standard with Machining STRATEGIST, including configurations for the latest machine tool controllers. These postprocessors, if required, are easily configurable by the operator.